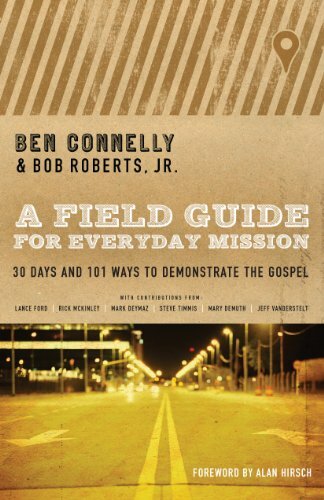 Today I am sharing my review for A Field Guide for Everyday Mission: 30 Days and 101 Ways to Demonstrate the Gospel, written by Ben Connelly and Bob Roberts, Jr. This book is all about showing how mission is a part of our lives every day. It isn’t just something that people do in other countries. If you are a Christian, you are a missionary. The book is split into 30 sections, to be read over 30 days. Each week has a theme: who, what, when, where, why, and how. These questions are answered and explained throughout the week. The authors give super simple ways to share Jesus with others in our everyday routine. For the most part, the authors focus on how to share the Gospel through love and kindness toward others everyday, while being honest up front about our love for Jesus. They also stress that we personally cannot bring people to Jesus, that rather God uses us to bring them closer, so He can do the work in their hearts. They also stress that they aren’t trying to turn us all into preachers, they are simply helping to equip us for the many situations in our lives which can, sometimes surprisingly, be used for missions, using the gifts and skills that we already possess. The tone and voice of the book was super friendly and relatable, which always makes a book that much more of a pleasure to read. I found myself chuckling out loud quite a few times. In addition, the book was extremely impactful. Most of the situations that they mentioned can be used for missions are things that I never considered before, but now I see what a wonderful opportunity it is. The physical, paperback book that I received is really well put together and of great quality. It is small and can be read quickly (like I did in order to write this review), but it is recommended to be read over the course of six weeks. Honestly, even if I hadn’t been reading it for review, I probably would have read it quickly anyways, since I was enjoying reading and learning so much, I was having a difficult time putting the book down. I gave this book 4/5 stars, and it is something that I definitely recommend to everyone. I’m actually thinking that this is the perfect gift for a friend of mine attending a Bible college and planning a missions trip in the spring. *I received a copy of this book from Moody Publishers in exchange for an honest review. All opinions are my own.